2 YR WARRANTY! w/ CARRY BAG, RAINFLY, POCKETS & E-PORT! An E-Port makes it easy to bring electrical power inside the tent. Easy setup in only 10 minutes. Snag-free, continuous pole sleeves for easy setup. WeatherTec system with patented welded floors and inverted seams to keep you dry. This rainfly not only gives you added protection from the weather, but it also allows you to crack your windows during a storm and still stay dry. 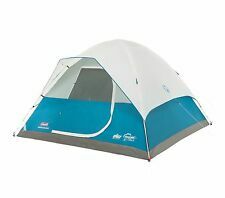 Coleman Rainfly fits Tent Size: 120" W x 108" D. This rainfly is for 10 ft. x 9 ft. (3.05 m x 2.74 m) 6-Person Coleman Instant 6 Tents. Easy setup in only 10 minutes. Snag-free, continuous pole sleeves for easy setup. - WeatherTec system with patented welded floors and inverted seams to keep you dry. Instant tent has pre-attached poles that make setting up camp as simple as unfolding, extending, and securing. This spacious 4-person tent is made from rugged Polyguard 2X double-thick fabric that stands up to the rigors of the outdoors, so you can use it reliably season after season. Trending at $99.00eBay determines this price through a machine learned model of the product's sale prices within the last 90 days. An E-Port makes it easy to bring electrical power inside the tent. Easy setup in only 10 minutes. WeatherTec system with patented welded floors and inverted seams to keep you dry. Large windows and a ground vent for superior ventilation. Get better airflow when camping in your Coleman Instant six-person tent with this Instant tent rainfly. Rainfly provides better airflow by protecting open windows from rain. Designed for Coleman's 10-by-9-foot Instant tents, the rainfly not only provides added protection from the weather, but it also allows you to crack your windows during a storm and still stay dry. A large rear hooded window also provides airflow for cross ventilation. The coated polyester fabrics on the fly and walls are rugged and durable. Freestanding design is easy to set up and take down. This Coleman 8 person tent can fit two queen sized airbeds. Its WeatherTec System ensures dryness for all occupants. This Coleman instant tent uses ground vents to improve air circulation. Fits two queen-sized airbeds. Functional, but. Very clean. (18) ground stakes(1) rain fly(1) tent(1) carry bag. This will include powering on the unit and checking all the major functions. Keep this in mind when buying an item as a gift or if you are a collector. Don't let the sun coming up or setting keep you front getting a good night's sleep with the Coleman Carlsbad 6 Person Tent. Using pre-attached, color-coded poles and hubs, the Coleman Carlsbad 6 Person Tent sets up 50 percent faster than other Coleman tents, and Illumiline reflective guy lines keep you from tripping at night outside the tent. You'll get even more weather protection from a door awning and an included rainfly. Setup is simple with snag-free, continuous pole sleeves, a patented pin-and-ring system, and snag-free Insta-Clip suspension. 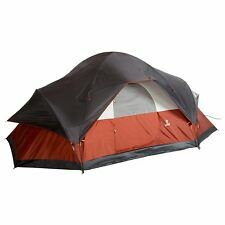 Like new, unusedColeman Highline II 4-Person WeatherTec Dome Tent Camping Hiking. Shipped with USPS Priority Mail. Our products cover different fields on outdoor activities including bags, tents, wagons etc. Timber Ridge TRTWF101078CGR01 always is a great choice for group camping. SPEEDUP quick open system is applied on this tent, it does not need assemble, set up in 1 minute or less, quick and easy. I opened the box to inspect and photograph the contents; however, I did not open the bag or unroll the tent. WARNING WARNING: This product may contain chemicals known to the State of California to cause cancer, birth defects, or other reproductive harm. � Set up in a minute. Cold Steel. Combos (Rod Reel). Pre-attached poles make setup a simple matter of unfold, extend and secure, so your tent is ready in about about 60 seconds. If it rains, the WeatherTec™ system with its patented welded floors and inverted seams will help you stay dry. The Coleman Instant Cabin makes getting camp set up quicker and easier than ever. 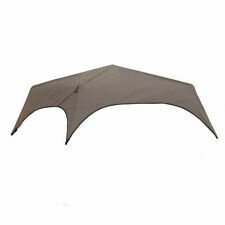 This instant tent has pre-attached poles that make setting up camp as simple as unfolding, extending, and securing. You can assemble the tent in about a minute and then get started on your adventure. Part Number: 2000024696. Coleman Signal Mountain 6P Instant Tent. Signal Mountain 6P Instant Tent. Manufacturer: COLEMAN. Up tp 33% more water resistant than a comparable standard Coleman® tent. E-Port makes it easy to bring electrical power inside your tent. Trending at $99.94eBay determines this price through a machine learned model of the product's sale prices within the last 90 days. You can grab a drink and an outdoor chair, and watch nature unfold before your eyes while you relax in the screen room. The Fast Pitch system uses pre-attached, color-coded poles and hub, fast fit feet and snag-free Insta-Clip suspension to let you set up your tent 50% faster than a comparable Coleman tent with conventional setup. WeatherTec system with patented welded floors and inverted seams to keep you dry. Spacious 8-person tent has enough room for 2 queen size air beds. THE KIDS WOULD DEFIENTLY HAVE FUN. Instant Setup. SIZE 14' X 10'. 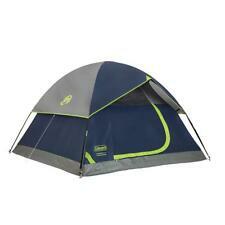 New in box, this 4-person tent sets up in as little as 60 seconds and is rain and wind tested up to 35 mph. Buy from a brand you can trust! Part Number: 2000033190. 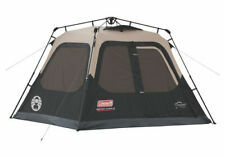 Coleman Carlsbad 6-Person Darkroom Tent w/Screen Room. You can grab a drink and an outdoor chair, and watch nature unfold before your eyes while you relax in the screen room. You can grab a drink and an outdoor chair, and watch nature unfold before your eyes while you relax in the screen room. If it rains, the WeatherTec system with its patented welded floors and inverted seams will help you stay dry. Manufacturer's Part Number: 2000019416. The fast pitch tents are lightweight, compact for simple set up with preattached poles, and no slip, quick setting feet. With exclusive WeatherTec system for enhanced storm protection you will feel safer. Signal Mountain 6P Instant Tent. Up tp 33% more water resistant than a comparable standard Coleman® tent. E-Port makes it easy to bring electrical power inside your tent. Poles:Steel and Fiberglass. Floor:Polyethylene 1000D. 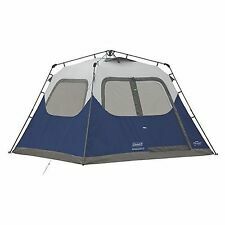 COLEMAN 8-PERSON TENT WATERPROOF WEATHERTEC INSTANT CAMPING HIKING OUTDOOR NEW! This tent is designed to hold up to the weather. Specially angled windows let in the light but not the water when it rains. This tent is large enough to fit three queen-sized airbeds. WeatherTec System: patented welded floors and inverted seams keep water out. Part Number: 2000018067. Manufacturer: COLEMAN. Pre-attached poles for fast and easy basic setup in about a minute. Buying is Simple. In case it will, we'll credit you less our S&H costs. Computers. The Coleman Signal Mountain Instant 4 Person Tent is your answer to quick shelter that sets up in about 60 seconds. Featuring pre-attached poles, you simply unfold, extend, and secure everything together. Up to 33 percent more water-resistant than a comparable standard Coleman tent. E-Port makes it easy to bring electrical power inside your tent. Spacious interior has room for 1 queen airbed. All Season. Trending at $93.99eBay determines this price through a machine learned model of the product's sale prices within the last 90 days. • 9 person tent. • Includes integrated led light/fan system. • Room divider. HELPFUL LINKS. Cold Steel. Combos (Rod Reel). Baits & Lures. Excellent Service. WARNING WARNING: This product may contain chemicals known to the State of California to cause cancer, birth defects, or other reproductive harm. MISSOURI RESIDENTS. Item Weight 43.52. Coleman Large 8 Person 14' x 10' Weathertec Instant Set Up Outdoor Camping Tent. Condition is Used. Has only been used a handful of times. In excellent condition. 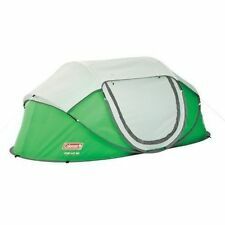 Coleman Montana 8 14x10 Tent Brand New.